Location. 38° 58.73′ N, 76° 29.051′ W. Marker is in Annapolis, Maryland, in Anne Arundel County. Marker is at the intersection of Cooper Road and King George Street, on the right when traveling east on Cooper Road. Touch for map. 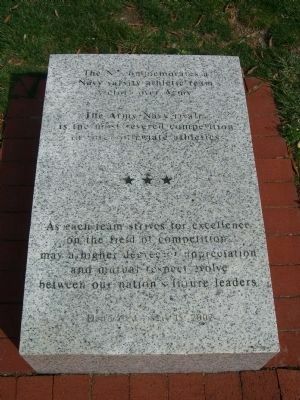 Marker is located on the grounds of the United States Naval Academy. A picture ID is required to enter the Academy grounds. Marker is in this post office area: Annapolis MD 21402, United States of America. Touch for directions. The flag pole is part of this marker. Note an N* flag is flying. 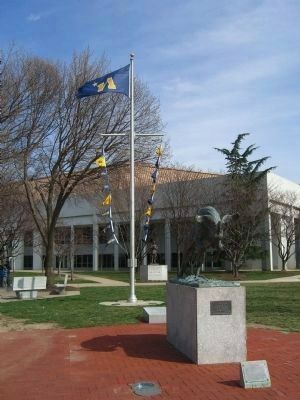 (a few steps from this marker); United States Naval Academy (within shouting distance of this marker); Greg Harlin's John Paul Jones's Ranger (about 400 feet away, measured in a direct line); Commodore John Barry (about 500 feet away); a different marker also named Commodore John Barry (about 700 feet away); Sy Mohr's City Dock Harbormaster Collage (about 700 feet away). Touch for a list and map of all markers in Annapolis. More about this marker. Midshipmen pronounce "N*" as "N star." Members of a varsity sports team wear a small gold "N" (about 1/4" big) on their working uniform (the uniform worn to classes). If their respective sports team wins its yearly competition against Army, the gold "N" is changed to a gold "N*" (N-star). More. Search the internet for N*. Credits. This page was last revised on June 16, 2016. This page originally submitted on March 22, 2008, by Kevin W. of Stafford, Virginia. This page has been viewed 1,105 times since then and 2 times this year. Photos: 1, 2. submitted on March 22, 2008, by Kevin W. of Stafford, Virginia.